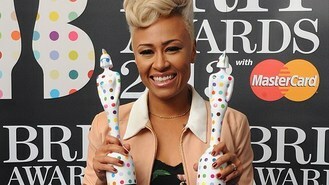 Chart-topping star Emeli Sande was the queen of the Brit Awards after collecting two of the biggest prizes as she declared: "This is a dream." The 25-year-old singer was named best British female and carried off the key prize of the night when her debut release Our Version Of Events was named best album. The ceremony at London's O2 Arena also saw another double winner with singer-songwriter Ben Howard named best British male and best breakthrough artist. World-conquering Adele added to her tally of Brits with the best single prize for her James Bond theme, Skyfall. And she joked about being allowed to finish her speech after being cut off when show bosses ran out of time last year and host James Corden interrupted her. In a video acceptance from Los Angeles, she said: "I won't keep you too long because I don't want to interrupt the best album speech at the end of the night." But the night belonged to Sande - who called herself "a very unlikely pop star" - with her double triumph. Just last year she had picked up the Critics' Choice prize as one of the year's top hopefuls. Since then she has had the biggest-selling album of the year, got married and appeared at both the opening and closing ceremony of the Olympics. Mumford & Sons picked up the award for best British group, two years after missing out on the prize when they were previously shortlisted. Boy band One Direction - who performed new single One Way Or Another on a giant pinball machine - took the global success award, recognising their international sales. The best international female prize went to Lana Del Rey. Meanwhile, Coldplay were declared best live act, beating the likes of Muse, Mumford & Sons and the Rolling Stones. Best international male was Frank Ocean and Black Keys took the international group prize.